Blessed Feast of Sts. Peter and Paul! Blessed Feast of Sts. Peter and Paul to you all! This Feast day, besides celebrating the glorious martyrdoms of the two most eminent apostles during the reign of Nero, also is the anniversary of this blog, which was first launched by Anselm and myself on June 29th, 2007 while we were both employed as DRE and Youth Director at our local parish. That was five long years and over 800 posts ago. Thank you for your continued patronage of this blog. May you be richly blessed. Pray for me, a sinner. In honor of the Feast of St. John the Baptist (June 24th), I thought it would be fun to tackle a question that bothered me for sometime: If the head of John the Baptist was presented to Herodias by Salome after the infamous dancing incident at King Herod's birthday party, how did the Christian community ever get possession of John's head? There are various places that claim to possess the head of St. John the Baptist. In the west, the two most notable locations are Amiens Cathedral and the Church of San Silverstro de Capite in Rome. The skull on display in Amien is clearly traceable to the sack of Constantinople during the Fourth Crusade (1204); the origin of the claim of the church in Rome is less certain. There are also several other churches that claim to have the Baptist's head, whole or in part, and some places that claim other related relics (Aachen Cathedral claims the cloth that his decapitated head was wrapped in, for example). "...on Herod's birthday, the daughter of Herodias danced before them: and pleased Herod. Whereupon he promised with an oath, to give her whatsoever she would ask of him. But she being instructed before by her mother, said: Give me here in a dish the head of John the Baptist. And the king was struck sad: yet because of his oath, and for them that sat with him at table, he commanded it to be given. And he sent, and beheaded John in the prison. And his head was brought in a dish: and it was given to the damsel, and she brought it to her mother. And his disciples came and took the body, and buried it, and came and told Jesus" (Matt 14:6-12, Douay-Rheims). It states very plainly that John's disciples came and took the body. This presents no problem, for presumably the body was cast out after John's execution and his disciples were easily able to retrieve it. But how would they have retrieved his head? Scripture says plainly that the head of John was given to Herodias by Salome. Beyond this, Scripture says nothing. Yet within a few generations, we see the Head of John the Baptist being venerated at Sebaste in Samaria. So how did the Church get his head back? I can't see that this as a tenable theory. Herodias must have known that possession of the head by John's followers would create a focal point for veneration of John's memory, and serve to instigate further disillusionment with the Herodian Dynasty. I cannot see any situation in which she would have willingly returned the head to John's followers? This is a traditional theory that has some merit to it. Nicephorus and Symeon Metaphrastes, two obscure Greek historians writing centuries after the fact (14th century and 10th century) state that the head was buried by Herodias in the fortress of Machaerus and later found miraculously by the local Christians. Another tradition has it being discovered in the Herodian palace in Jerusalem during the time of Constantine, then transfered to Emesa where it was later discovered by revelation in a dream. These theories are plausible, but they all depend upon invoking a direct revelation from God which, while certainly not improbable (e.g. the discovery of the relics of Gervasius and Protasius by St. Ambrose through a dream), it depends upon the validity of some very, very late testimonies. This is the explanation I prefer. While it is unlikely that Herodias returned the head to John's followers, I do not think she personally would have kept the head in close proximity to her either. I guess we could posit a situation where the vengeful woman kept the skull on her bedside table to perpetually gloat over her victory over John, but I think it more probable that after the head was presented to her by Salome, she probably either discarded it or had it casually tossed away. Pagans and those of the Greco-Roman culture (like Herodias) had a very superstitious fear of dead bodies and I don't think she would have wanted to hang on to the severed head. Therefore, I think that after seeing the head brought to her by Salome, she probably gave it to a servant or slave and instructed them to dispose of it discreetly - get it out of the household, but not let it fall into the hands of the followers of John or Jesus. "When they came back from the tomb, they told all these things to the Eleven and to all the others. It was Mary Magdalene, Joanna, Mary the mother of James, and the others with them who told this to the apostles" (Luke 24:9-10). As Herod's chief steward, it is probable that Chuza was given the head by Herodias with instructions to discreetly dispose of it. Chuza probably then entrusted the head to Joanna, a disciple of Jesus, who in turn brought it into the Christian community. To me this explanation makes sense, is plausible and is supported by what the Scriptures tell us. This is certainly possible, though I don't believe the head of the man who even in his own day was known as the forerunner of the Messiah and the one whom Jesus acclaimed as the greatest of those born among women (Luke 7:28) would be simply lost to history. Are the Bayside Apparitions False? Yes. I have been having a lot of discussions with a friend of mine lately about the alleged "Bayside Apparitions" of Veronica Lueken (for the background of the Bayside apparitions, see here). I have not done nearly as much research on Bayside as I have on Medjugorje, but from what I have been reading it has some of the same problems - disobedience to the local bishop when he does not condone the visions of the seer, bizarre "warnings" foretold, miracles the whole world will see, and thousands upon thousands of banal messages - in fact, the Bayside messages are even more awkward and banal than those at Medjugorje, if that were possible. Bayside also has some unique elements to it, such as the insistence that Pope Paul VI was murdered or kidnapped in 1972 and replaced by an actor who had plastic surgery and a coming "Ball of Redemption", a comet that will strike New York City, and belief in the Rapture. All religions have a place in heaven? Here the visions clearly state that, although Catholics have a special place in heaven, other "faiths and creeds" also go to heaven. This is clearly heretical. Note the Ball is said to be sent "within this century." This prophecy was given in 1988. Therefore, the fact that by 2000 this had not yet happened proves conclusively that this is false. We should always remember Deuteronomy 18: "When a prophet speaks in the name of the LORD, if the thing follows not, nor comes to pass, that is, the thing which the LORD has not spoken, but the prophet has spoken it presumptuously: you shall not be afraid of him...a prophet who presumes to speak in my name anything I have not commanded him to say, or a prophet who speaks in the name of other gods, must be put to death" (Deut. 18:22, 20). "Among the wonderful technological discoveries which men of talent, especially in the present era, have made with God's help, the Church welcomes and promotes with special interest those which have a most direct relation to men's minds and which have uncovered new avenues of communicating most readily news, views and teachings of every sort. The most important of these inventions are those media which, such as the press, movies, radio, television and the like, can, of their very nature, reach and influence, not only individuals, but the very masses and the whole of human society, and thus can rightly be called the media of social communication. The Church recognizes that these media, if properly utilized, can be of great service to mankind, since they greatly contribute to men's entertainment and instruction as well as to the spread and support of the Kingdom of God... support should be given to good radio and television programs, above all those that are suitable for families. Catholic programs should be promoted" (Inter Mirifica, 1-2, 14). Maybe our Lady did not mean to condemn television absolutely; if not, the words are sloppy and imprecise, as it says there is "no excuse" for ever having a television. Mary here says the television is of diabolical origin; the Church says they were made "with God's help." The messages conflict at worst and are ambiguous at best. So was or was not Paul VI replaced by an impostor in 1975? The 1975 apparitions say so, but the 1977 apparition speaks of him as still in power and warns of his impending martyrdom, which did not happen. They could perhaps say that he was secretly murdered or poisoned to get him out of the way, but that would not be a martyrdom. Regardless, this stuff about Paul VI being replaced with an impostor is, in my opinion, nonsense. Pope Benedict XVI has come after John Paul II. Benedict has not tried to destroy John Paul; on the contrary, he has beatified him and is pressing for his canonization. This prophecy was clearly false. In 1984 it was predicted that there would be another assassination attempt on John Paul II. But there wasn't. Nobody every tried to kill John Paul II again after the first 1981 attempt. This is another false, unfulfilled prophecy. Granted, there were other alleged conspiracies to kill John Paul II, but nothing like a real attempt. One could always say that the attempt was thwarted by the prayers of the faithful - but then again, one can always allege that a purported judgment or calamity did not happen because the prayers of the people forestalled it. It is a perpetual out for these people whenever a prophesyed judgment does not materialize. This simply has not happened. The Church is more united now under Benedict XVI than it was in the 80's under John Paul II. The 80's were the nadir of the Church's unity - things have gotten much better, not worse, since the death of John Paul II. Most troubling is that the Bayside apparitions promote the false Protestant "rapture" doctrine, which is clearly a heretical teaching that no Catholic ought to hold. This is the Protestant rapture theory plain and simple - a group of elect taken away from the earth prior to the second coming. And by the way, someone should tell the Virgin Mary that the plural of media is media, not "medias." Communion in the hand has not been accepted by heaven? That is funny, since it was practiced for centuries in the Early Church. While communion in the hand might not be prudent, it is too much to say it is not accepted by heaven. In the Early Church and for the firsts several centuries of Christianity communion was given in the hand. This was the practice of all the great saints of the Early Church, including the apostles. Over time, the church in the Middle Ages changed the discipline to prevent certain abuses and safeguard the dignity of the sacrament, as it was their right to do. This was the discipline until the modern Church restored the practice. Now, we might rightfully debate whether or not this was a good idea, but how can our Lady say communion in the hand cannot be accepted by heaven when it was the practice in the universal Church for the first six or seven centuries? We even have a saint, St. Tarcisius, who was layman that was martyred while trying to take communion to someone else - i.e., while holding Holy Communion in his hand. Also, although restoring communion in the hand in the modern age may not be prudent, none of the accepted rites or disciplines or the Church can be positively harmful or diabolical in and of themselves. They might be bad ideas; they might lend themselves to abuses, but in themselves they cannot be harmful if they are authorized by the Church. Otherwise, the Church would be promoting something that was sinful through its rites, which can never be the case. Otherwise, the role of the Church as the dispenser of God's graces is nullified. Now, this is kind of ambiguous, I grant. Perhaps it means that by leaving the Church you lose sanctifying grace, and that would be acceptable. But it does not say that. It says leaving the Church causes one to lose their "baptismal right" and no longer be viewed as a Roman Catholic. If taken literally, this would be problematic. The teaching of the Church is that baptism confers and indelible mark or character that can never be effaced, no matter what sin or apostasy the person commits. Grace may be lost, but the character of baptism may never be lost. Once a Catholic, always a Catholic - perhaps a bad Catholic, perhaps a fallen away Catholic, but always a Catholic. This is another example of the imprecise language rampant in the Bayside apparitions that detracts from their credibility. Now I know this is contested and I am not 100% certain on this, but it seems to me that most reputable theologians do not believe the antichrist will be a Pope. It would mean that the promise given to Peter that the Gates of Hell would never prevail against the Church would be compromised; how could it not be if the source of the Church's unity was the antichrist? The antichrist as Christ's vicar? The Fathers of the Church do not ever suggest that this is possible; the antichrist is seen as a false prophet, as a political leader, but never as the pope himself. I would say this teaching is very troubling and will cause the faithful the mistrust and suspect the papacy rather than listen and be taught by it. He must be getting old - this prophesy was delivered in 1974, thirty-four years ago. So according to Bayside, the antichrist will take the Seat of Peter and was alive and walking around in 1974. This is not heretical as much as reckless and dangerous. No spiritual director would tell you to call out an unknown angel by name like that. Only Michael, Raphael and Gabriel should be addressed by name since they are the only names we know. Who is Tomdarius? Is he an angel? A demon? Should we call out to something when we don't know what it is? There is a good reason that the Church's cultus of saints and angels consists of those who have some sort of formal recognition of being part of the City of God. This is all very questionable. Creazuus? Tuzaseri? Who knows what these things are. And if they were revealed to Veronica by heaven, why can't she remember their names, as she says above? I have never heard of legitimate seer or visionary forgetting part of a message from God. One of the judgements on whether or not an apparition is true, according to spiritual masters, is "Do we find that the dignity and seriousness which become the Divine Majesty?" What is the purpose of this frivolous description of an angel acting like a clown? When an apparition behaves like this, it suggests it is not legitimate (see here for an earlier post on criteria for judging private apparitions). Bayside proponents have countered that the process the bishop has used was improper and therefore his decision is invalid. Whether or not this is the case, it does not justify disobedience. If they really have a case that their bishop acted against canon law, the Bayside proponents should appeal to Rome and in the meantime be obedient until directed otherwise. To just state, on one's own authority, that the process the bishop used was flawed and then continue in disobedience is a big warning sign. When Our Lord said "he who hears you hears Me", He was not instructing his followers to "hear" that which "pleased them" - but to be obedient to lawful authority (even if those in lawful authority were sinners - even mighty sinners) in matters of Faith and Morals, such as alleged apparitions. Bayside is bunk. Medjugorje is bunk. Garabandal is bunk. SSPX and Vatican Reconciliation Imminent? It is official. The Vatican has offered the SSPX a personal prelature as the mechanism by which the Society of St. Pius X and Rome can be officially reconciled. The SSPX can avail itself of Rome's offer only by submitting to the much discussed "Doctrinal Preamble" that was proposed in Fall of 2011 and presumably will mean a consensus on some of key points of doctrine surrounding Vatican II. The Doctrinal Preamble has not been made public and we have no idea what it contains, but I think we can infer that it must be very generous to the Society. If this were not the case, negotiations would have never gotten this far. Had the Vatican's demands been too exacting, or the doctrinal conditions too stringent, or the Preamble set up in such a way as to deprive the SSPX of its fundamental charism, there is no way Bishop Fellay would have continued the talks and allowed them to go this far. An SSPX reconciliation would an impossibility were the Preamble too demanding. Thus, I think we can presume that the Preamble proposes only the most basic requirements on the Society, those minimally necessary to put them in good standing with the Church - probably an acceptance of the legitimacy and authority of Vatican II and of the Novu Ordo Missae. If this is the case, there will still be room for discussion and interpretation of Vatican II within the Church. If the SSPX accepts the personal prelature, this certainly does not mean they are going to adopt the same outlook on everything as the mainline Church; Pope Benedict does not intend the reunion to necessitate this, nor would the SSPX agree to it if it did. As long as some basic points are agreed to by the Society, the agreement leaves in place a future discussion on the issues dear to the Society and Traditionalists. This fact is of fundamental importance, because in essence, it means that the Pope is affirming that a valid debate about Tradition and Vatican II can take place among Catholics all in good standing with the Church. The discussion on the role and importance of Tradition will now take place within the context of the Universal Church. In allowing leeway for the SSPX to retain its charism and still be part of the dialogue on Tradition within the Church, the Pope affirms that the SSPX charism and some of their critiques of the modern Church are indeed legitimate, so long as they occur within the guidelines laid down in the Doctrinal Preamble. Or, to put it more plainly: While we must affirm the authority and complete legitimacy of Vatican II, the agreement will signal that there is no official historiography of Vatican II. Other opinions on the role and influence of the Council are valid. Questioning the fruitfulness of the Council will no longer equate with dissent. "The most likely scenario, therefore, is that when the dust settles, there will still be a traditionalist body on the outside looking in, presumably still led by validly ordained rebel bishops, but reduced in size and significance because some of its former members and leadership will be back in Rome's good graces." Should the SSPX accept the personal prelature, the Traditionalist schism will still not be entirely healed. Many SSPX will refuse to reunite with Rome; my guess is that these remnants will ultimately become Sedevacantists or adopt some other bizarre heresy and drift off into oblivion, much like the Old Catholic Church. For my part, I am of course presuming that the Doctrinal Preamble requires nothing of the SSPX beyond what is reasonable to ensure their loyalty to the Universal Church. I am presuming that the Doctrinal Preamble is going to be perceived as very generous, and by the liberals, much too generous. Assuming this is the case, if the SSPX does not agree to this arrangement - if they continue to nit-pick on minutae, or insist that Rome "convert" before they can even begin discussions, or if they continue to attack the person of the Holy Father, I will lose all respect for their organization. The fact that these negotiations are even happening was inconceivable prior to 2005. Things have come so tremendously far in seven brief years. The Holy See is sincerely reaching out and trying to bring them in, knowing that the reunion of the SSPX with the Church would mean tremendous blessing to all - the Church will have an infusion of some of the best educated and best formed clerics in the world, while the Society will obtain canonical legitimacy and all the graces that come from being in full union with the Successor of Peter. I hope the SSPX realizes that this is a question of their very existence. If they reject this offer (or if a portion of them do), whomever remains outside the Church will dwindle in numbers, in support, and finally will spin off into formal heresy. That's what always happens. Those of the SSPX who do not take up this offer and return to Rome will cease to have any significance in the coming years. 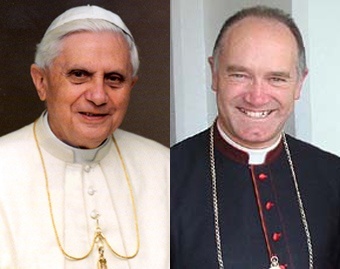 I hope Bishop Fellay will do the right thing here and end this tragic schism. Pray for the reunion of the SSPX and the Holy See. For the past year, I have been working through all the writings of St. Cyprian of Carthage in the process of putting together a book on the great Father. [Now completed; click here to purchase] In honor of the Feast of Corpus Christi, celebrated earlier this week, I present to you some of greatest quotes from St. Cyprian on the Eucharist. "[A] woman who in advanced life and of more mature age secretly crept in among us when we were sacrificing, received not food, but a sword for herself; and as if taking some deadly poison into her jaws and body, began presently to be tortured, and to become stiffened with frenzy; and suffering the misery no longer of persecution, but of her crime, shivering and trembling, she fell down. The crime of her dissimulated conscience was not long unpunished or concealed. She who had deceived man felt that God was taking vengeance" (On the Lapsed, 26). "Christ is the bread of those who are in union with His body. 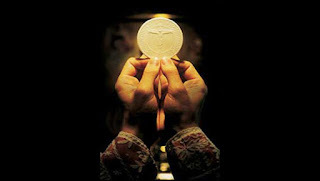 And we ask that this bread should be given to us daily, that we who are in Christ, and daily receive the Eucharist for the food of salvation, may not, by the interposition of some heinous sin, by being prevented, as withheld and not communicating, from partaking of the heavenly bread, be separated from Christ's body, as He Himself predicts, and warns, "I am the bread of life which came down from heaven. If any man eat of my bread, he shall live for ever: and the bread which I will give is my flesh, for the life of the world." When, therefore, He says, that whoever shall eat of His bread shall live for ever; as it is manifest that those who partake of His body and receive the Eucharist by the right of communion are living, so, on the other hand, we must fear and pray lest any one who, being withheld from communion, is separate from Christ's body should remain at a distance from salvation; as He Himself threatens, and says, "Unless you eat the flesh of the Son of man, and drink His blood, you shall have no life in you." And therefore we ask that our bread— that is, Christ— may be given to us daily, that we who abide and live in Christ may not depart from His sanctification and body" (On the Lord's Prayer, 18). "[T]he soldiers of Christ ought to prepare themselves with uncorrupted faith and robust courage, considering that they drink the cup of Christ's blood daily, for the reason that they themselves also may be able to shed their blood for Christ" (Letter 55:1). "Let us also arm the right hand with the sword of the Spirit, that it may bravely reject the deadly sacrifices; that, mindful of the Eucharist, the hand which has received the Lord's body may embrace the Lord Himself, hereafter to receive from the Lord the reward of heavenly crowns" (Letter 55:9). "For when Christ says, "I am the true vine", the blood of Christ is assuredly not water, but wine; neither can His blood by which we are redeemed and quickened appear to be in the cup, when in the cup there is no wine whereby the blood of Christ is shown forth, which is declared by the sacrament and testimony of all the Scriptures" (Letter 62:2). "Yea, it is the great honor and glory of our episcopate to have granted peace to martyrs, so that we, as priests, who daily celebrate the sacrifices of God, may prepare offerings and victims for God" (Letter 52:3). "[W]e ought in the ordinations of priests to choose none but unstained and upright ministers, who, holily and worthily offering sacrifices to God, may be heard in the prayers which they make for the safety of the Lord's people" (Letter 67:2). "When the blood of the Lord and the cup of salvation have been drunk, the memory of the old man is laid aside, and there arises an oblivion of the former worldly conversation, and the sorrowful and sad breast which before was oppressed by tormenting sins is eased by the joy of the divine mercy; because that only is able to rejoice him who drinks in the Church which, when it is drunk, retains the Lord's truth" (Letter 62:11). St. Cyprian, ora pro nobis! The prevalence of divorce within Christian groups as opposed to the divorce rate in the world at large has long been an occasion of discussion. Divorce statistics are tracked by age group, but if you average the divorce rates across different ages groups, we get an average divorce rate of 18.5% for couples under 39 in the United States (source). Unfortunately, it has long been documented that divorce rates among Christians are little better than divorce rates in the world. This is true of all Christian groups; with some, it is higher - non-denominational Christians and baptists have divorce rates that are higher, on average, then their secular counterparts. Catholics are lower on the list, but unfortunately, still not too much different from the world. This poll elicited a lot of anger in the evangelical Protestant world particularly, where it was typically accepted a priori that Christian families were stronger than secular families. Barna had to defend his results in a New York Times article where he reaffirmed that when it came to divorce rates, pollsters "rarely find substantial differences" in the divorce rates of Christians and non-Christians. In the Protestant world, I am willing to bet that the ultimate acceptance of divorce and remarriage as permissible has something to do with it. When I was a teenager, my wife and I attended a small non-denominational church where I was stunned to find that almost every single adult couple there had been divorced and remarried. To be sure, there has been a general trend towards divorce in the modern world that is affecting the Catholic Church as well. But why does the Church's traditional teaching on the indissolubility of marriage not have the force it once did? There are many factors - worldliness of many Catholics would be a big factor - but without denying the influence of these other factors, I'd like specifically to look at the issue of Catholic marriage preparation and the tools that Catholic couples are given going in to marriage. Since there has been such a creeping of worldliness into the Church in the past several decades, could it be that we are perhaps taking a worldly approach to our marriage preparation as well? Why not? We have adopted secular theories about architecture, secular ideas about the role of the priest, about how Church government should work, about the nature of different sacraments, about music and even secular concepts creeping into our approach to certain dogma. Should we presume that our approach to marriage or marriage preparation is any different? I must say that I did not have Catholic marriage prep. I was married in a schismatic group that was not bound by any diocesan regulations about marriage preparation. All I know about marriage prep comes from anecdotal stories, and everything I am reporting is anecdotal. But from what I have heard, it seems that, even in our best dioceses, there is a creeping worldliness that has bled into our marriage preparation. In the first place, I would highlight an over dependence on modern psychological theories about how men and women interact. Some dioceses require compatibility tests that are based on personality analyses; many of these tests are secular and have an unnecessary emphasis on sexuality and ask a lot of sexual questions. In some cases, the results of these personality-compatibility tests are made the central focus of the entire marriage prep process. Advice on how to handle conflict is based on the latest theories of psychologists and secular concepts of how men and women do, or should, interact. Standard secular ideas about "conflict resolution" may be utilized. Whether you find this problematic depends entirely on how much value you place on modern psychology. Some, like Fr. Chad Ripperger, FSSP, has written a massive three volume series on the science of psychology and how it interacts with the Catholic Faith. His treatment is based on a Thomistic approach and seriously questions the philosophical underpinnings of modern psychology. Others, notably Fr. Benedict Groeschel, CFR, have enthusiastically adopted the whole edifice of modern psychology without reserve. To what degree is modern psychology a valid means of understanding our Christian faith and preparing one for the sacraments? To be sure, some aspects of psychology have valid scientific principles behind them, but others are based on a determinist anthropology that sees human behavior as determined by non-rational factors (chemical makeup of the brain, heredity, instinct, subconscious, etc). This, in my opinion, is problematic. But whether or not any given marriage prep program adopts the modern psychological theories, it seems that too much emphasis on strategies of conflict resolution, personality compatibility and all these other concepts tends to dumb down the role of God's grace in the marriage. If a marriage is successful, it will be because of God's grace, not because we have integrated the latest psychological research into our marriage preparation courses. The marriage does not stand or fall based on knowledge of how men and women's emotional needs are different. It stands or falls based on how effectively a man and a woman can imitate Jesus and Mary and respond positively to God's grace made available through the sacrament. Can it be that we over intellectualize our approach to marriage, deeming that a marriage can be made successful by knowledge and application of a bunch of secular psychological principles? Do we place too much faith in the studies and theories of psychologists and not enough in the working of God's grace? If the divorce rates within the Catholic Church look a lot like those in the world, might at least part of the problem be that we are using worldly ideas to prepare people for marriage? Marriage prep programs vary tremendously from parish to parish and diocese to diocese, so I am making no hard statements here, only proposing something that I think merits further discussion. What do you think?